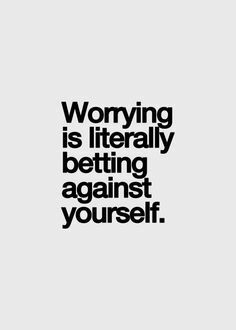 The idea that worrying is “betting against yourself” might be true, but I actually don’t think that is bad! In my work, if I am worried that something I’m doing isn't good, I end up working much harder on that task. Then I don’t worry about it in the end, because I know that I have done the absolute best that I can. I think that goes for the job search as well. When I worry, I start to pick apart every detail of my work. This leads to hours and hours improving whatever I’m working on, and it usually turns out great! Right now, I am “worried” that my cover letter doesn't completely show my best strengths. But I have two options: I can turn it in and worry that it isn't good enough, or I could work on it and perfect it until I KNOW it’s good enough. In the end, I think it’s okay to worry, depending on the way you handle it. You have to turn worry and doubt into action, and make everything you produce AMAZING. Let’s all make our lives amazing! Have a great day and leave a comment! P.S. I’m really excited about this particular job because they are asking for links to all of my social media profiles, and I love all my social media profiles.